On an ordinary Sunday afternoon, humanity was attacked by beings it has never seen before, called Senteptriones. The difference in power between these beings and humanity is great, but there are people who can summon demons and use them to fight. Our main character is one of them(obviously), and, along with his two high school friends, enters the secret organization created to protect humanity from Senteptorions and prevent Armageddon. But the catch is that there is a time limit of seven days. Nothing original, but it’s passable nonetheless, and the time limit actually makes it better, in my opinion. It created more tension, helped the buildup and ensured the fact that there would be no pointless filler episodes. As the show goes on, the plot delves deeper and deeper, and answers questions that will bug you from the beginning. Believe me, they will. 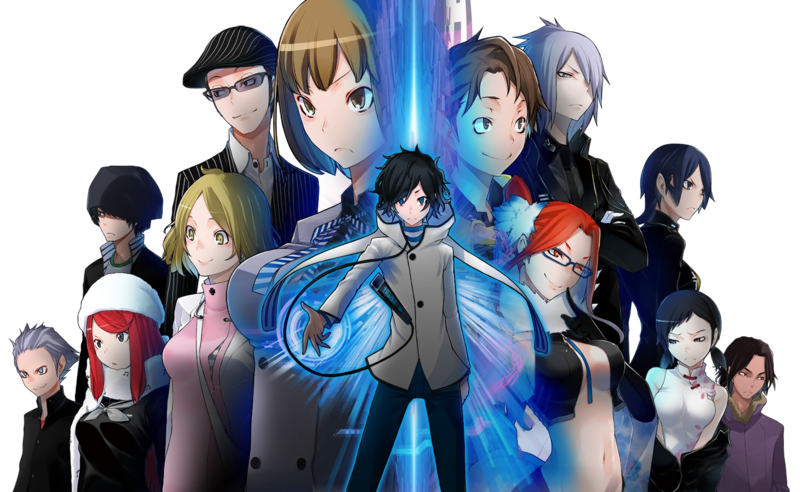 All in all, I like it but the biggest complaint I have is that even though Devil Survivor opens some philosophical topics, it just plays with them and doesn’t give any answers. The storyline seems undeveloped and doesn’t open it’s potential. It could have been much better, deeper, but in reality, the creators just took a bite they couldn’t swallow. Also, after a certain point in the plot, further development is pretty obvious. Surprisingly, characters in this anime are rather nice. No outstanding individuals, either in a good way, or bad. Almost all of them are rather stereotypical, but not to the point when it’s painful to endure. We have our tsunderes, cool females who are terribly underdressed for some reason, hyperactive idiots, shy girls and characters with a developed god complex. But there’s nothing bad about that. It’s just average. But there are several things I would like to note. First of all, the main heroine, Nitta, pleasantly surprised me. Usually, a female lead characters in shows like this are either for developing romance, comic relieve or a plainly blobs of fanservice, but Nitta is none of that. Sure, she’s shy, cute, has a crush on the MC and a D cup, but rather than relying on others, she struggles to keep up with them and help them in battle. Sure, she cries and does a couple of stupid things but when her friends needed her, she stood up for them and protected them, whenever she could. Strong female characters are a rarity in anime, but Nitta has made it into my list. Also, the MC, aka Kuze Hibiki is a little atypical, definitely not what I expected. He’s not some delinquent or a genius, he doesn’t have high goals in life, he just wants to be a normal college student. That he makes clear right from the start, but when he realizes that people’s lives and the world itself are at stake, he toughens up and fights. Also, develops a little hero complex along the way, but it’s okay. Aint nobody need an unmotivated protagonist! Now, graphics. First of all – character designs are crap. The only one who looks good is Hibiki. The rest of them look bad, uninspired and dull. Too obviously matched to their archetypes. That aside, the backgrounds are beautiful and detailed. Color palette is quite cold, a lot of blues. The show doesn’t look as cold and crisp as K, it’s quite a bit darker. But they do give off similar vibes. Animation was also neat. The demons looked good, but the fights weren’t that great. Not in terms of animation itself, but it was just a plain concept of ‘hit as hard as you can’. Oh, and don’t forget to scream at that, too. All in all, the animetion wasn’t impressive by any means, but it looked neat and clean all the time, and the quality didn’t change during the show, which is good. Sound. One of the strongest parts of this anime, if you ask me. I liked the OST for Devil Survivor, because each track fit the scenes perfectly, set the right mood and created an atmosphere. And sounded epic, too. Nakagawa Kotaro, duh. Something he’s really good at is sounding epic. Overall, this show makes me really, really sad, because it’s painfully mediocre, when it could have been so much better. The impression I had is that it was made by an amateur, because the plot, characters and events were all over the place and felt very unorganized. You know what is happening and why, but the show feels very inconsistent at the same time, almost as if each episode was redone several times by different people. Some were better than others, but all in all it felt like a definite amateur work, and I don’t understand why the hell that happened. Philosophical contemplations were headed in an interesting direction, but they didn’t fully open the subject, which is very bad. All in all, Devil Survivor 2 falls flat on it’s face into the ‘painfully mediocre’ category, when it could have been ten times better, if managed correctly by someone more experienced. Personally, I would love to see this anime managed by Urobuchi Gen, but oh well. Another potentially great anime flushed down the toilet. But lastly, I have to note that concidering all flaws and faults of this anime, it’s still quite respectable, watchable and enjoyable. So if you have free time and like shows like this, you should definitely try it. Just don’t expect a lot.